Time may march on inexorably, but the words we use to talk about it can be surprisingly unsteady. Here’s a little background on a few of our more interesting words for time. hour - The Proto-Indo-European root for year came down through the Germanic branch of the family to become our word year. But in the Greek to Latin to French branch it shifted meaning and ultimately became our word hour. Slight difference! An hour was a variable period of time for centuries, and even when it was first applied to the twelfth part of a day (sunrise to sunset), it wasn’t a fixed amount of time, because the amount of daylight sunrise to sunset wasn’t a fixed amount of time. 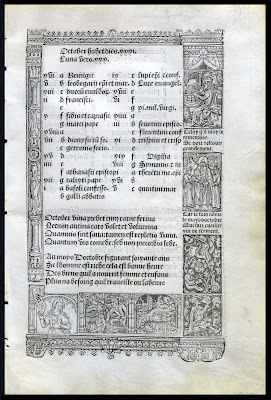 Fixed-length hours were invented in the fourth century, but right up until the sixteenth century people sometimes referred to “temporary hours,” meaning the division of the day that changed with the seasons. morning - Morning got its -ing from hanging around too much with evening. The original word was simply morn, which was a contraction of Middle English morwen. Also, it originally referred more specifically to dawn, whereas now it can stretch from midnight to noon. noon - Noon used to come at about 3pm, and derives from Latin for the number nine. In Old English non meant “the ninth hour,” and the ninth canonical hour fell at 3:00 in the afternoon. (Except it wasn’t after noon then!) The shift in meaning happened over the twelfth to fourteenth centuries when the time of church prayers shifted, and/or the time of the midday meal shifted. October - October is another word that came loose from its etymological moorings. As most people recognize, its Latin root means the number eight. That’s because it was the eighth month in the old Roman calendar, which began in March. (You can still see the seven in September, the nine in November, and the ten in December, too.) The switch to the Julian calendar in 46-5BCE moved the start of the new year back two months, leaving the month names looking a little silly. season - Originally meaning “the act of sowing,” the word shifted to name the time of sowing, i.e. spring, and then eventually spread to the other periods of the year. Where I am we’ll be resetting our clocks to “fall back” this coming Sunday, and as the time changes, I’ll be thinking about how our language does, too. 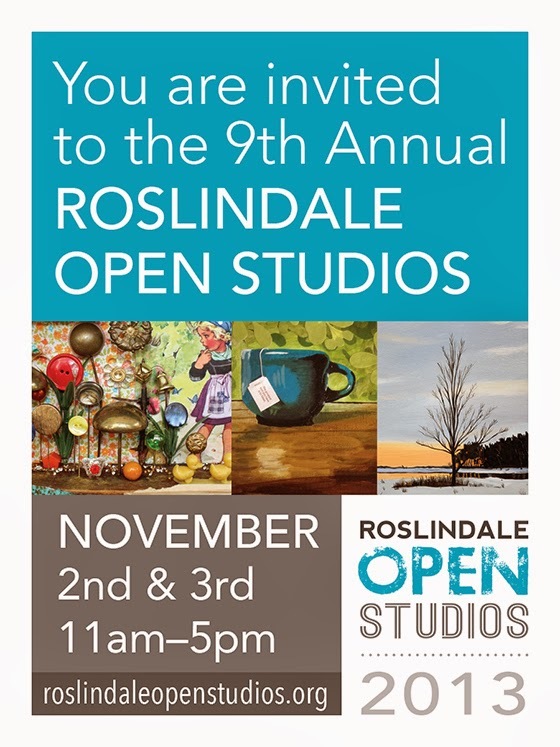 This weekend I'll be at Roslindale Open Studios, the biggest show I do each year. Come out and see a huge variety of art! I’m back, with a new computer, trying to get used to the changes, and trying to catch up after being computer-less for three days. At least everything was backed up safely. Whew! In high school I had made a few linoleum blocks for family Christmas cards, as many an artsy-craftsy person has done, but I didn’t particularly love it. Then this new carving rubber came out and, because I was an art teacher, I was sent a free sample of the stuff. That was the best advertising dollar they ever spent, because it was love at first cut. Actually, though, I didn’t really start working on my own prints at that point because I was too busy being a teacher. Then I got married, and moved to New Hampshire for D’s second year of a two-year grad program, and rather than try to get a full-time teaching job for one year, I worked part time on after-school classes. 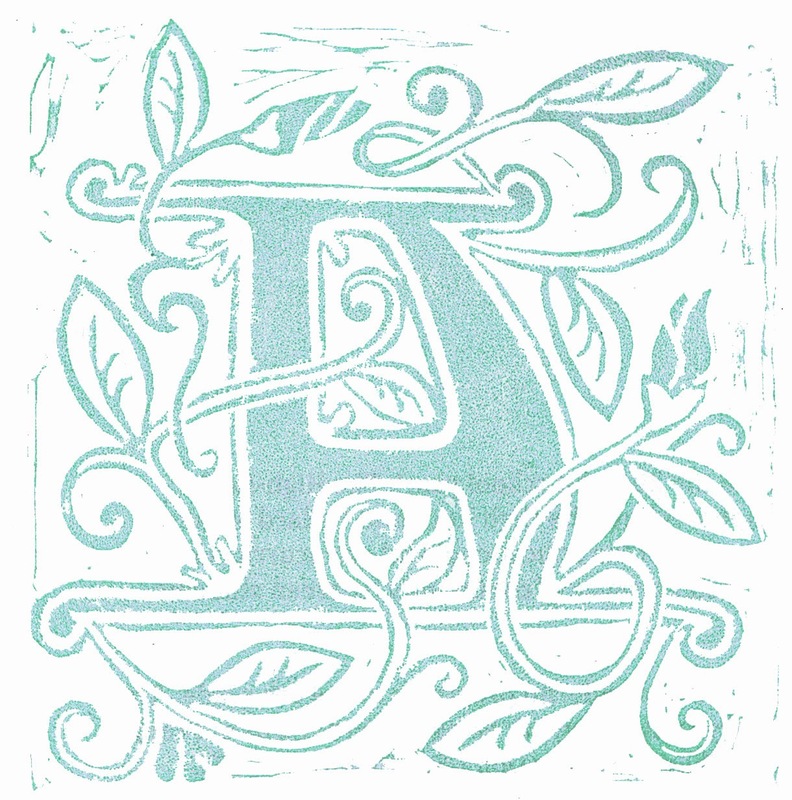 Moreover, I got to take a free class at the gallery where I was teaching, and I chose a wood block printing class. That’s what gave me time to work on block prints and cemented my conviction that relief block printing was the artwork I wanted to be doing in my time. I rediscovered this old rubber block recently while putting other stuff away. It’s that first rubber block I ever got my hands on: the free sample. I never printed an edition with it, because I wasn’t thinking of myself as an Artiste then, much less expecting to sell my work. I printed up some notecards for myself with acrylic paint on ordinary paper, and then packed the block away. 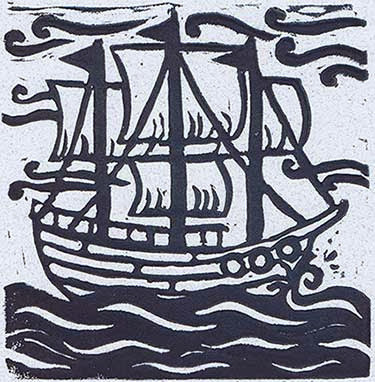 But when I found it not long ago I decided that the little ship was pleasing enough to do a small limited edition (in slightly bluish-black on speckled blue card stock, to be quite different from the earlier prints I made.) So here it is. 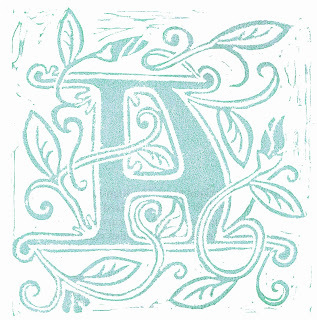 The initial A is the design I carved on the other side of the same block. I don’t remember which I actually did first, but in any case, here they are: the first rubber block prints I ever made. 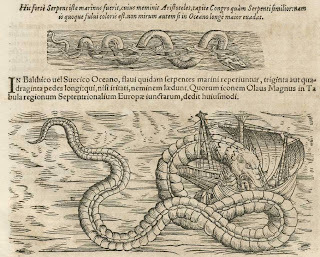 The wily Sea Serpant I seen. And what was his color? you asks. Like you would of expected ‘im to! And his tail was the shape o’ his brains. Fer o’ course you’ve seen Sea Serpants’ legs. His length it was seventeen miles. (Me memory’s sich that I can’t recall which. Though at figgers I’ve seldom been beat). In a way that I can’t understand. And walked through the ocean by land. And somehow I knowed he’d come back. And forty-eight cents by the map. 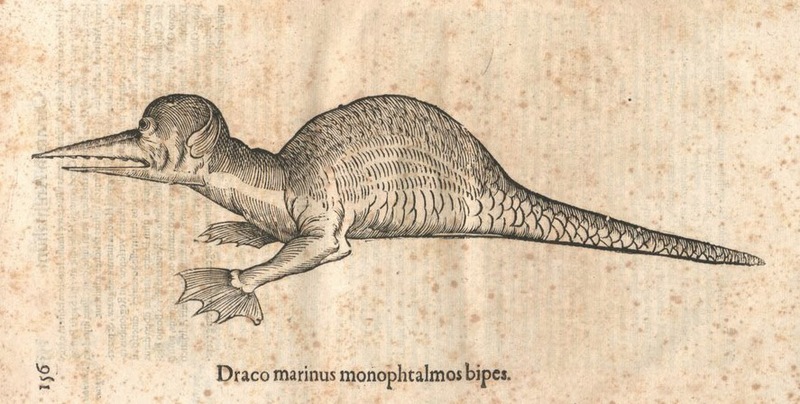 Draco marinus monophtalmosbipes, wood block print from Monstrorum historia by Ulisse Aldrovandi, 1642. Poem by Wallace Irwin, Random Rhymes and Odd Numbers, 1906. This coming weekend I'll be showing at Natick Artists Open Studios. Come by to see me and my work, to ask questions, to chat, to grab a snack, and to have a little art adventure that's fun for all! I'll be downstairs in the Morse Institute Library. I thought it was time again for something different, out of the usual range of relief block prints that I post. Of course, in all logic it's inevitable that if I usually post things I really love, then something very different from that is likely to be something I don't really love. I'm afraid that's the case today. 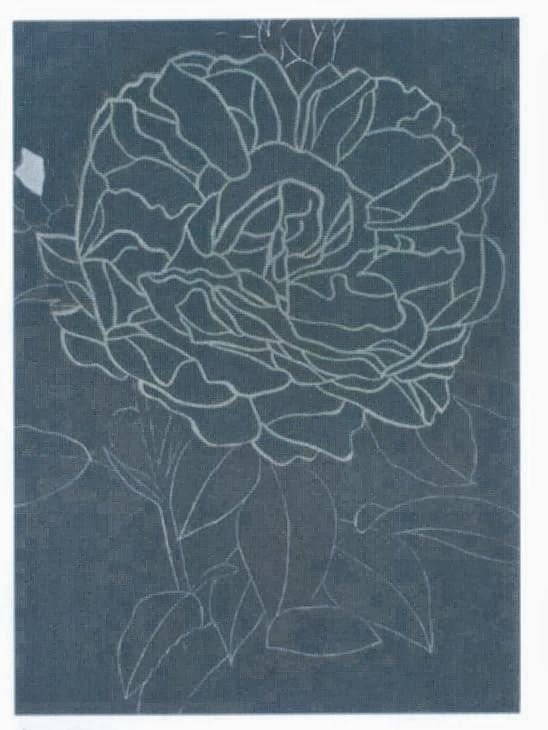 I don't find myself much enjoying Gary Hume's linocuts of flowers. They are, to my taste, boring and more suited to textile designs than art I'd want to spend time focussing on. And even as textile design, I wouldn't choose them! But after all, it's all just a matter of taste, and the Tate considers these to be fine art. So let's take a closer look. 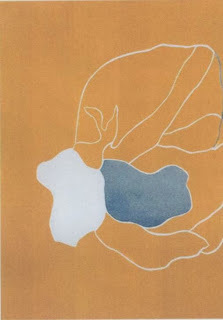 pieces in the series, on the other hand, the flowers are less obvious. In several he zooms in on one small portion of a flower, with a result that looks almost abstract. I don't object to the idea of art reduced to simple lines - after all, I like many of Matisse's pieces, and I've even done a couple in that style myself. I don't object to art that turns an everyday object into an abstraction - after all, I'm a big fan of Georgia O'Keeffe. Nevertheless, I'm just not feeling any allure in these particular prints. Perhaps it's the colors, which I find somewhat ugly; I might like these lines better if they were pure white on vivid black. 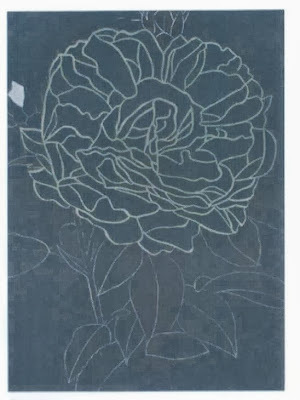 Perhaps it's the chosen flowers, which either leave the print awfully blank or are fussy many-petalled affairs. But whatever it is, it's my opinion. Maybe you feel differently. Do these linoleum block prints sing to you? If so, please share what it is you love about them! Here's the latest piece, finished Wednesday, which I had a lot of fun with. I was first thinking of cool places to build little cities, having already put cities in a tree (Tree Palace), on a giant sea turtle (Aspidochelone), and on an air ship (Sky City). 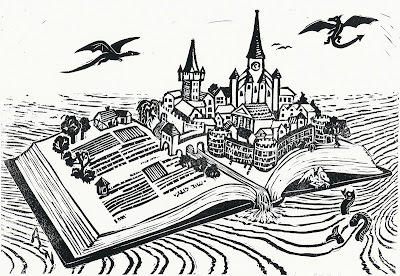 But once I began to imagine a city growing out of a book, I realized that this idea is much bigger. It's more than just a cool fantasy scene. It's a love letter to books, and a tribute to the magic of story and imagination. I was thinking about the new worlds that exist within books and the exploration possible between their covers. 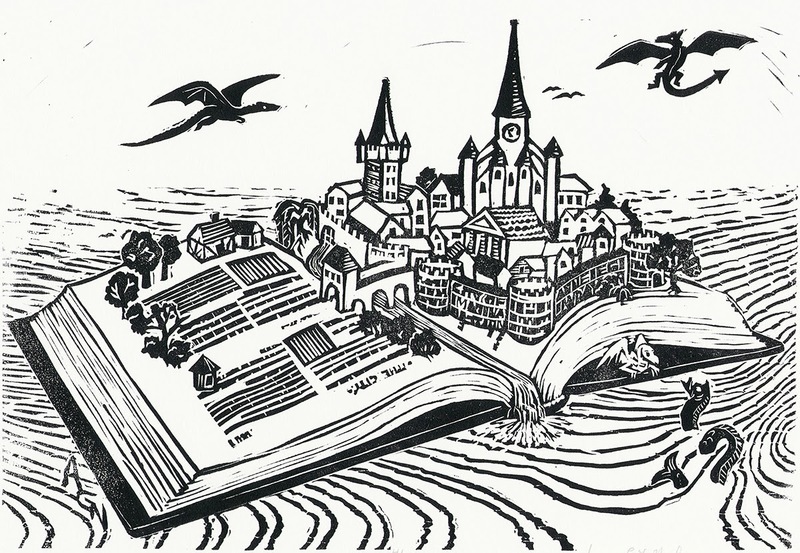 I don't mean just new fantasy worlds, either, although of course I happen to have made a fantasy image with its medievalesque architecture and its dragons. After all, every time you open any book you're embarking on an adventure of discovery. Sometimes you might learn new things about our own real world, sometimes you might learn new things about the human heart, and sometimes you might just have a nice vacation. As T.S. Eliot said, "We shall not cease from exploration, and the end of all our exploring will be to arrive where we started and know the place for the first time." Titles for art can be so difficult. Sometimes I just stick with the basics, like calling the armadillo Armadillo. But a title can also be an opportunity to hint at multiple levels of meaning, and that's what I was hoping for here. Alas, it's so hard to be deep without being cheesy, clever without being pretentious, subtle without being obscure. And then, of course, probably nobody cares about the title except me anyway, and I'm wasting my time worrying about it! Oh well. Here it is, and I hope you like it! On the morning of Tuesday, July 8 three important things happened, although no one was to realize their importance until later. This is often the way with Important Things. Some arrive with trumpet fanfares or ceremonial hats, but many Important Things are small and don't reveal their importance right away. That was how it was on this particular Tuesday. 1. At 9:46 AM a nondescript man in a grey suit and fedora paused in a park in Cleveland, Ohio, and glanced over his shoulder. This in itself is not unusual, of course, as men in suits hurry through parks in every major city in the world, even in July, and fedoras are not especially ceremonial. But this particular man did something that was to prove Important. After looking around hurriedly, he reached inside his suit jacket, pulled out a flat rectangular package wrapped in a plastic bag, and thrust it beneath a bench. Straightening up quickly, he was already walking away when, moments later, a policeman dashed into view. The first officer was followed by three more, all shouting, "Stop! Police!" The man in the grey suit fixed a polite smile onto his nondescript face, turned around casually, and said in his most innocent voice, "Oh, did you mean me? What can I do for you, officers?" 2. At 10:02 a large moving van pulled up at the delivery dock of Goggin Antiques, Appraisals, and Auctioneers, bearing assorted valuable bits and pieces belonging to Ambrose P. Hinkelman III. Ambrose III was the great-grandson of Rutherford J. Hinkelman who had been one of the ten richest men in America when the railroads were king, and who had countless libraries, museums, and universities named after him. But Ambrose III, who had inherited everything, wasn't a big fan of of art and books, or of giving his money and things away to museums or libraries. He'd had all those useless antiques packed up and sent off to Goggin Antiques to make as much cash as they could on the auction block. He had no interest in any of that old junk. The Hinkelman collection was of much more interest to the three people who watched the van drive up. One was Ms Miranda Goggin, who would receive a very nice commission for appraising and auctioning off these assorted old and dusty objects. The second was Mr Raphael Green, Ms Goggin’s assistant, who would help with everything from unloading the van to displaying the art for wealthy buyers. The third was Ms Goggin's thirteen-year-old daughter Polly, who was sitting on the edge of the loading dock, swinging her feet in their polka-dotted sneakers, and humming a rather tuneless tune under her breath. Polly always enjoyed watching the unpacking of a new load. Who knew what odd or beautiful treasure might emerge from the back of a delivery truck? Once when she was little there had been a dramatic painting of a sailing ship at sea, a stormy black sky behind it, rough waves smoothing themselves beneath its hull, and ahead of it a glowing red sunset over a peaceful harbor. She had stood in front of that painting every night for months, until it had eventually been sold to a Japanese collector. Another time a van driver had unloaded a magnificent collection of twenty-three taxidermy crocodilians of all different sizes and species. And yet another time there was a huge gilt clock with a picture of a stark naked Apollo driving the sun-chariot across the face, and a fantastic secret cubby on the left side. This time, although Polly didn't know it yet, of course, the most Important thing on the delivery van was to be a certain old book, leather-bound, a little crumbly, and altogether extraordinary. 3. At 11:54 a boy sat on a park bench with a sandwich in one hand and a library book in the other. He closed the book with an involuntary grin and turned his attention to the sandwich, which had only two bites out of it because it hadn’t been nearly as exciting as the book. Chen looked around, his mind still on the story he had just read and the ingenious way in which the wizard’s apprentice had outwitted the evil emperor and, with the help of the clever scullery maid and the friendly flying laundry basket, reversed the spell that would have destroyed them all… But the grin faded from his face as he remembered that he wouldn't be able to sit down with his best friend to savor this latest development in their favorite series. Because his parents had made him move to this stupid new city. Here it was, not even the middle of July, and he wouldn't meet anyone until seventh grade began at the very end of August, and probably even then he wouldn't like any of them, or none of them would like him, and he’d be a miserable social outcast forever, and all his mother could say about it was, “Remember, Chen, when one door closes, another opens.” As if that was any consolation. He scowled at the scene around him with something approaching loathing… the gently curved shore of the artificial lagoon, the fountain sparkling in the sunlight, the broad line of marble steps rising to a building like a splendid Greek temple beneath a pure blue sky… Actually, Chen quite liked the Cleveland Museum of Art where his parents were now the curators of the Department of Prints and Rare Books, but now that he'd finished reading his book, he felt bored and lonely again. He stooped to pull a carrot stick from the lunch bag at his feet and suddenly noticed something odd about the plastic bag lodged under the bench. It was taped - taped up neatly like a package, not like some random scrap of litter blown there by the wind. For lack of anything better to do, Chen reached for the plastic bag. It was a package all right, but without any name or address. He turned it over in his hands. A book, definitely. You couldn't mistake that shape. After a moment's hesitation, he tentatively ripped open a corner of the bag and was surprised to see that the book was bound in leather. Old leather. This was a book that would interest his parents. He shoved the last bite of his sandwich into his mouth, gathered his lunch bag and library book, and headed up the marble steps to the museum, with the mysterious plastic-wrapped book under his arm. He was gone just as a nondescript man in a grey suit came strolling casually across the street moments later, heading for a bench that no longer had a very Important Book beneath it. I anticipate that The Extraordinary Book of Doors will be released in early March 2014. 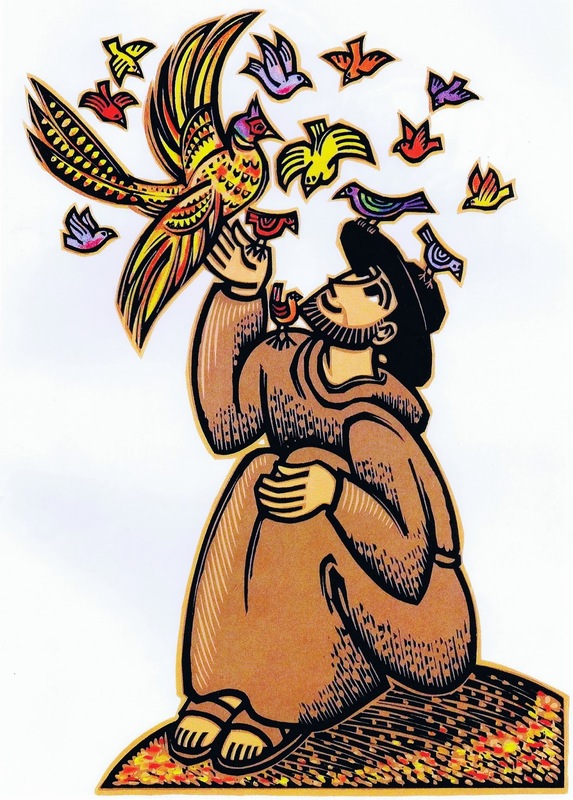 Today is the feast day of St Francis of Assisi. Now, I'm not Catholic and generally not much of one for the traditional Catholic saints, but I do like Francis. Besides, he's a wonderful subject for art, because of all the birds and animals. So I've collected a few block prints depicting St Francis with his creature companions around him. First up, a pleasing stylized portrait by Ade Bethune. At first glance the animals aren't even obvious, but a closer look shows them making up the swirls and patterns of the background decoration, along with Brother Sun, Sister Moon, and some plants. I particularly like that Bethune features humble animals, including insects and a snail, instead of the flashier big mammals. I also like her Francis's face: gentle, but not so meek as to be limp. He looks quite stubborn and determined. 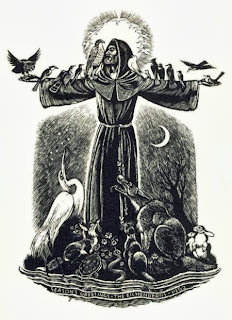 Much much more detailed is this image of St Francis preaching to the birds, by M.C. Escher. I'm always a devoted fan of Escher, but I have to admit this isn't my favorite. The saint's head seems a bit too exaggerated, his leg too emaciated. But the birds are a lot of fun, with their wonderfully textured feathers, and their great variety of beaks and expressions. Two of them even have halos of their own. I like how fascinated they seem with Francis's preaching - except the big bird in the upper left, who looks quite taken aback and downright dubious about what he's hearing. 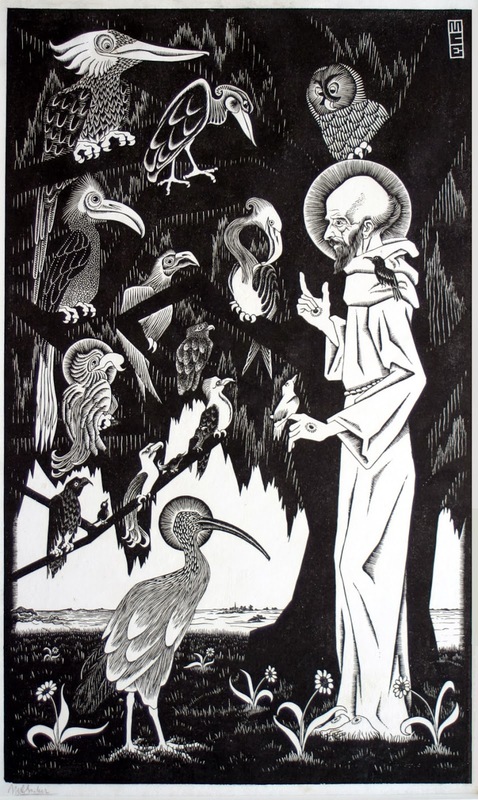 Fritz Eichenberg's version is just one of a number of woodcuts he made of St Francis. This one was a personal image made for family and friends, without the sharp satirical edge of so much of his more political work. If you look closely, Francis's halo is made of birds, which I think is a cool touch. 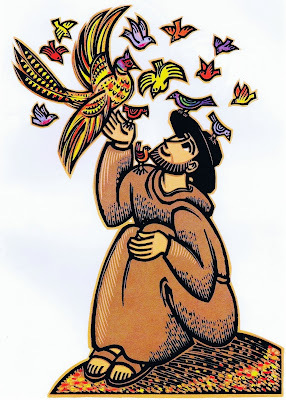 Finally, a particularly friendly-looking Francis by David Frampton. 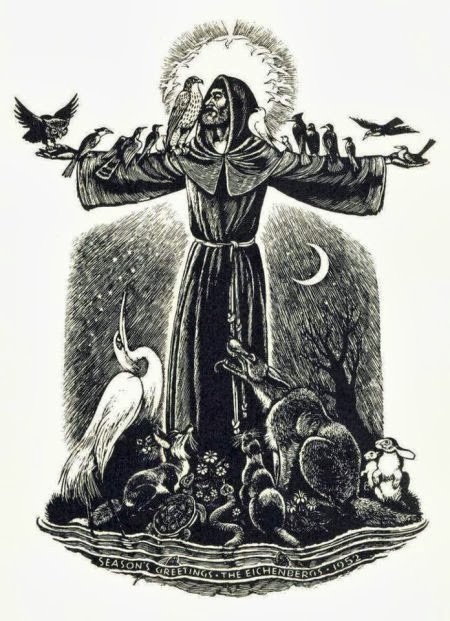 This comes from a book in which Frampton has made illustrations of Francis with a wolf, a worm, flowers, people… But I think this is one of the nicest stand-alone portraits, even though it is just the birds once again. Today is the day when many churches do "Blessing of the Animals" ceremonies. I've never been to one, but it does sound like a fun tradition - although I really don't think our cat would find it the least bit fun! But in any case, whatever your religion, it's never a bad day to celebrate kindness to animals, reverence for life, care for the natural world, patience, humility, and the desire to walk in the footsteps of one who preached love. 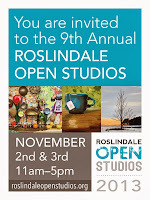 Just a reminder, if you're local, come visit Dedham Open Studios on Sunday. Say hello, and see lots of cool arts and crafts by a huge variety of artists. I'll be at Dedham Community House. 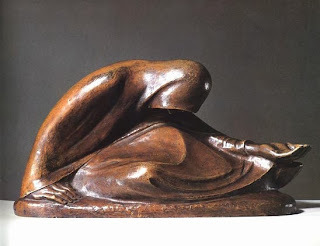 Ernst Barlach (1870-1938) was a German Expressionist artist best known for his sculptures. In fact, I like his sculptures more than his wood block prints (!) because they have a wonderful boldness and simplicity, and yet they simultaneously have a delicacy and lightness that shouldn't be possible with such heavy, angular shapes. Although his wood block prints don't have the same simplicity, with a much sketchier, more textured look, they still have a lot in common with the sculptures. I've chosen two images of God, representing the first day and the seventh day from Barlach's book The Transformations of God. 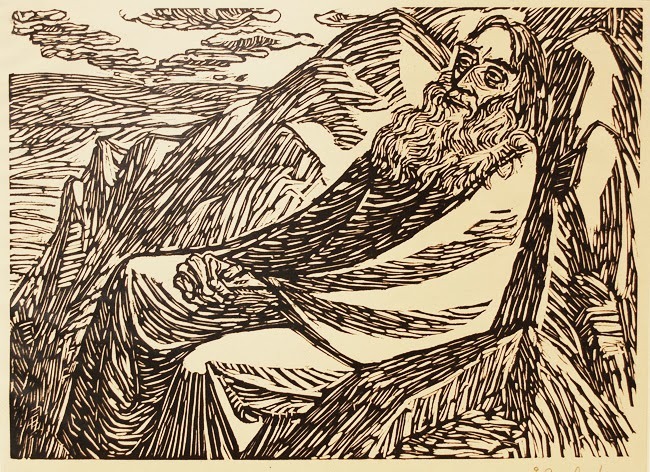 Despite the two images I've chosen, the seven woodcuts in the series aren't the seven days of creation as described in the Bible. 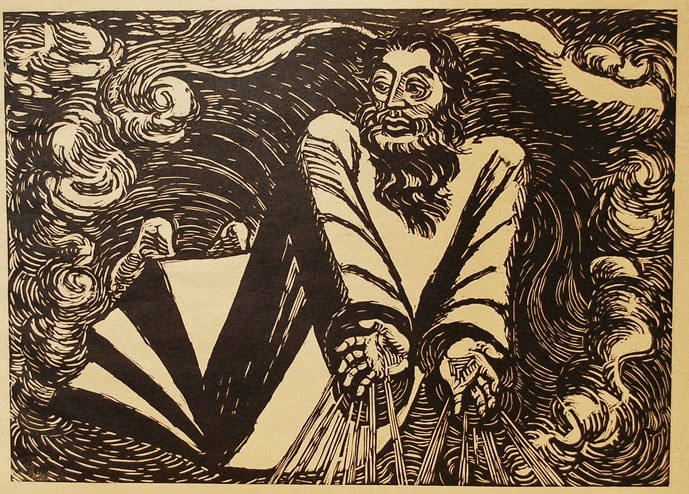 The middle images represent human activities, human lack of spiritual fulfillment, suffering, the power of love… However, the bracketing images of God as a figure of power, stability, and compassion sum up Barlach's message of divine presence. Now, my personal theology most definitely does not see that divine spirit as a big old man with a beard. That said, I recognize that all our images and descriptions of God, all our names and words for the divine, are only metaphors, partial hints at different aspects of something we can never wholly grasp, like the Blind Men and the Elephant. And given that, I'm fine including big-old-man-with-a-beard images as part of the artistic vocabulary that strives to make tangible some small part of our human sense of what's so much greater than we are. In the first woodcut, you can see a very clear similarity between God's robe and the sorts of draperies Barlach carves in his sculptures. The face, also, has Barlach's signature sharp cheekboned look. The round, rolling, soft clouds, on the other hand, are quite different. I think they make a nice contrast with God's starkly angular figure. 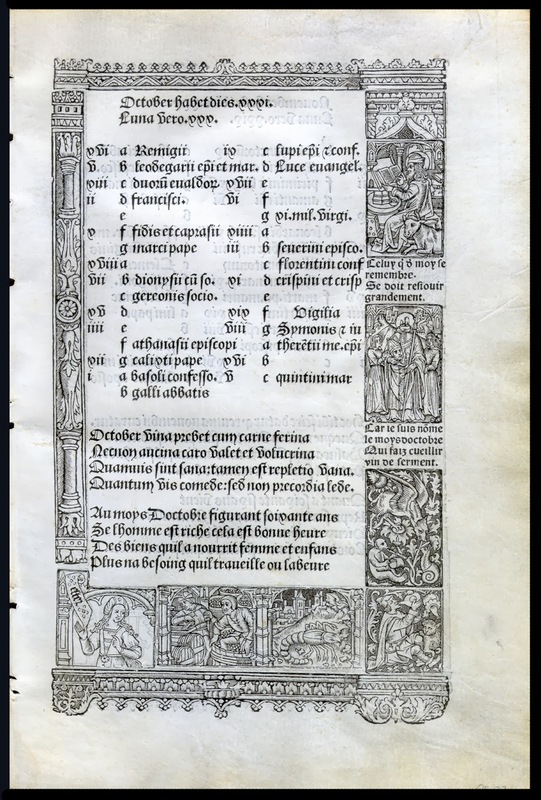 In The Seventh Day Barlach has used no solid black at all, only textured lines. I think this adds to God's appearance of weariness. I usually picture God being a little more triumphant on that last day, but in Barlach's series this piece comes after a lot of suffering and disappointment, so it makes sense that it should show a God who feels a little bittersweet about the creation. Visually, I really like the drape of God's robe and the shape and texture of the mountain behind. 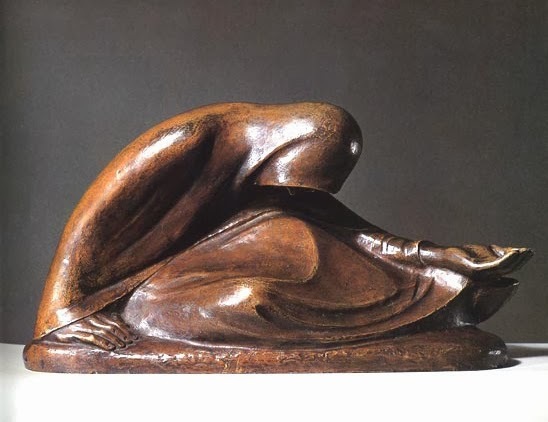 In all his art Barlach shows a concern for the suffering of the outcast and the downtrodden. Yet he doesn't concentrate on the ugliness of our world. Instead he shows the dignity and grace that are present even in sorrow. I admire that.